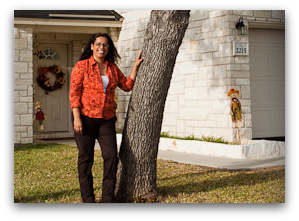 A divorced mother of two, Dannielle Hernandez-Romero built her house in 2007 in a new development in Leander, Texas. Her mortgage loan was through Countrywide and everything seemed to be going fine. "I was making my payments, no hiccups," Hernandez-Romero says. In February 2010, she received a notice from Bank of America saying Countrywide had incorrectly assessed her property taxes and her monthly mortgage would increase $500 per month starting March 1. “It didn’t surprise me,” Hernandez-Romero says. “All my neighbors were going through the same thing since we all moved in at the same time and were assessed at the same time.” However, Hernandez-Romero has multiple sclerosis and cannot work. She lives off disability payments, and an additional $500 a month was simply not in her budget. Bank of America told her about the Making Home Affordable Program, or HAMP, and she entered the program on a trial basis, knocking her monthly payments down from $1,200 to $800. Hernandez-Romero made her adjusted loan payments every month, and every month she would call to ask about the status of her loan modification, but she never got an answer. Returning from an out-of-town trip in late August, Hernandez-Romero arrived to find a certified letter from Fannie Mae notifying her that her property would be foreclosed on in September. She immediately called her lender, who told her she was still making her payments and still being approved for HAMP. The bank rushed her some more paperwork and told her not to worry. On September 9, more paperwork arrived. It said the bank had foreclosed on her home. Following the suggestions in the posts, Hernandez-Romero filed complaints with the OCC and the Texas State Attorney General’s office. After filing her complaint she gave me her case number, and I passed it along to an internal contact at the OCC. “Once they got my case number, I got a call the next day,” Hernandez-Romero says. Today, Hernandez-Romero is optimistic. Bank of America is in the process of getting her loan back from Fannie Mae and redoing the loan documents. The bank is also revoking the foreclosure. “We are focused on continued improvements in the modification and foreclosure process, including enhancing and introducing new programs to meet the evolving needs of our customers,” says Bank of America spokesman Dan Frahm.